I recently discovered Rangriti - an women's ethnic wear brand that offers a wide range of bright and happy Indian wear at very reasonable prices. In Hindi, the word rang means color while riti means fashion so the brand name embodies a fusion of the two and brings out a line that is a fine blend of feminine cuts and beautiful shades in sync with the latest fashion trends. Rangriti has some beautiful designs a very attractive prices and is perfect for gorgeous pieces that can be added to you daily wear wardrobe. 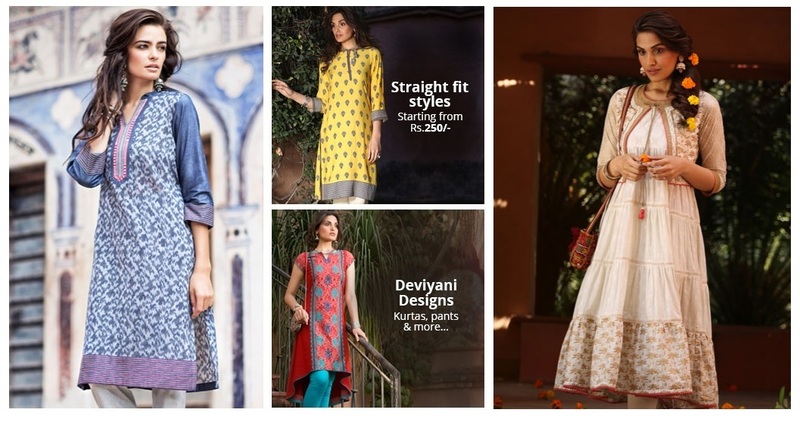 With a wide range of beautiful kurtas, anarkalis, churidars, dupattas, leggings and kurtis in vibrant prints, colors and patterns, the brand aims to bring freshness, variety and style to every woman’s closet. Make sure to check out their site if you're looking for pretty looking and affordable kurtis online. How gorgeous is this yellow salwar kameez set? This blue printed kurta is perfect for daily wear for a college student or working woman. This flared kurta is a milder version of an anarkali and can be worn on a casual basis. Overall, I loved a lot of designs and styles on the Rangriti website and was even more amazed at how affordable the items are. Make sure to check out this brand if you're looking for affordable ethnic women's fashion online! It's really so good to know, because I think you know - I am a huge fan of Indian fashion, always when I can I wear it! These are so beautiful! The colours are just stunning.